Wheelchair users can now also join in the fun. Improve your fitness and meet new friends as part of a welcoming, inclusive and social club. 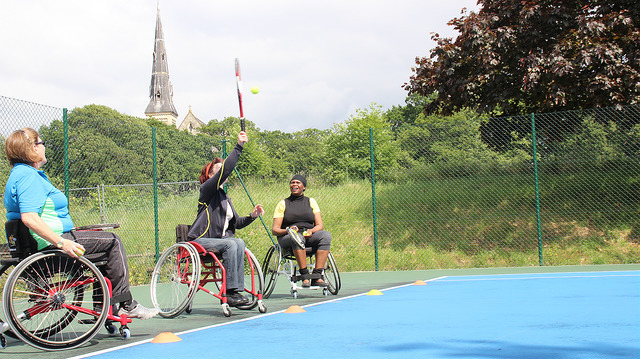 Camber is proud to be the first and only venue to offer regular wheelchair tennis in any of the three South London boroughs of Southwark, Lambeth or Lewisham. These have been available since June 2015. The weekly sessions are run by a specially qualified coach and are completely free of charge apart from a small annual subscription for regular attendees. All equipment, included sports wheelchairs, is provided. With a brand-new, fully accessible clubhouse and state-of-the-art courts there will not be a better opportunity to try this exciting and fast-growing sport. For more information and to register please contact Chris Smith on 07956 142070 or chris@tennis-at-camber.org. You can read reviews of our sessions and facilities on Euan’s Guide, which contains disabled access reviews by disabled people and their families. Our wheelchair sessions are also listed on www.ableize.com, the virtual library of UK disability resources, owned and run by people with disabilities.